A belated post about a patch tick. A dead computer means I haven't been able to post about the latest addition to my patch list - white-winged black tern. We were down at Druridge shortly after 5am for a ringing session - our first of the year. We had a good morning catching over 30 birds, mainly resident warblers and remarkably five reed warblers, all by the little the reedbed in the SE corner of the big pool. Reed warbler is recent colonist to Druridge Pools and seem to be doing very well, as they are at other wetland habitats in the county. A green sandpiper flew over the site first thing with swifts ! After packing up the ringing site and checking the heronry with Ian Fisher, I thought a quick check of the sea might be in order as others had reported skua activity. The light was awful and just as I was about to leave, a message about a white-winged black tern at Chevington came through.... Interesting. 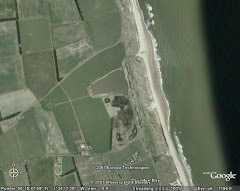 I hung around, scanning inland when Twitter said it was at Druridge Pools. But where? Big pool or Budge fields? I sprinted to the top of the big dune, my heart was pounding when I got there, figuring I could see the while patch from there. I was right and picked up the bird feeding over the Budge fields. And what a stunner it was - an adult white-winger in breeding plumage. It flitted back and forth between the Budge fields and the big pool for an hour or more. Sadly no photos for me as my camera was in the car but others did well. A bonus came on Sunday when I was scanning the sea and a message came through from Martin Kerby who was watching a pectoral sandpiper from the Budge screen. I was soon in the hide and watching the bird, albeit occasionally, as it moved through the emergent vegetation and stands of rush. White-winged black tern takes my Druridge Pools list to 243, creeping ever-so-slowly towards that big 250!